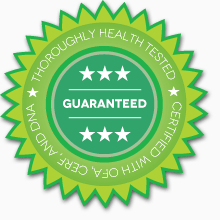 All the parents are fully health tested and certified with OFA, CERF and DNA. This helps ensure you are getting the very best bred puppy possible. We give a 2 year health guarantee (read below). Puppies come to you up-to-date on deworming, vet checked, raised by the “Super Puppy” method using ENS for the first two weeks. Volhard Temperament tested for a perfect placement, fed Life’s Abundance super premium dog food and NuVet Plus supplement, Micro chipped with Home Again, imprinted to eliminate in the litter box plus use the dog door and potty on the grass, super socialized with children, raised in the house and pre-spoiled. If Puppy is found during the Preliminary Examination to have a congenital health defect, Buyer may return Puppy for (i) full refund of the purchase price of $_____, or (ii) choice of a Puppy from a future litter at the Seller’s earliest reasonable convenience. Failure to return Puppy for any congenital defect discovered in the Preliminary Examination will bar any future claim under section 5. Any amount refunded will be reduced by actually incurred third party out of pocket expenses paid by the Seller to facilitate the return of Puppy to include travel and shipping. Written notice of an intent to return Puppy must be provided to Seller within 72 hours of receipt of Puppy and must be accompanied by a copy of the Preliminary Examination. If notice is provided by e-mail, the Preliminary Examination may be provided separately by US Postal Service or express mail. Notice by US Postal Service or express mail will be effective upon postmark or time of receipt by the carrier. Notice by electronic mail will be effective at time of receipt by Seller.